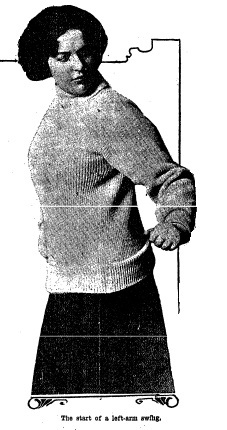 Ruth Helen Lang presents some of her tricks to defend herself in 1911 New York. By the turn of the 20th century, women were finally starting to be widely accepted as students of martial arts and combat sports. Lessons in Jiu-Jitsu, fencing, cane, savate, boxing and even kendo were now open to them. The reasons behind this shift would deserve a book of its own but to make a very simple generalization the advances in women’s rights and the increasing danger faced by city dwellers in an urban landscape which was larger and scarier than ever were most probably the biggest reasons for that change, but were these lessons profitable? It is very hard to say to what proportion they were, but for many of them… it worked. The villains of the day had several catchy names: plug uglies, cads, dudes, oglers, footpads but the one which was especially a concern to women was the “masher”. 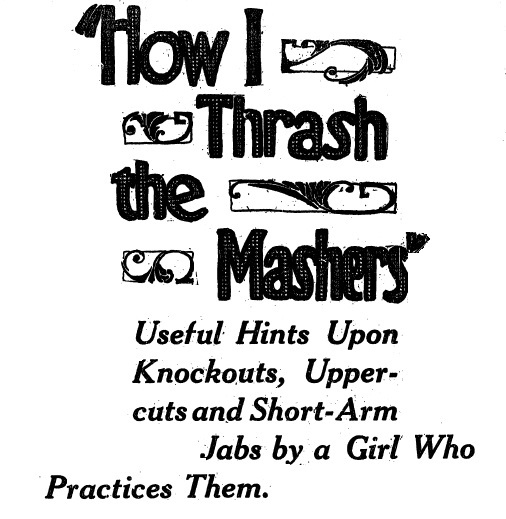 The masher could be considered today a sexual aggressor although as you will see the tolerance to unwelcome advances was very low around 1900 and self-defense was applied much earlier than is common today. By examining period newspapers, we discover many colorful altercations between would be victims and the poor mashers who probably never foresaw the dangerous situation they were putting themselves into. 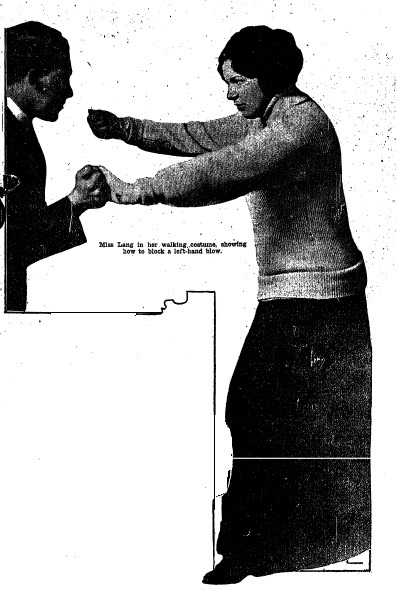 Some women such as Miss Myrtle Byrnes had the fortune of being accompanied by the likes of Bob Fitzsimmons – former boxing World Heavyweight Champion – who quickly dispatched a would-be masher in the Saratoga Hotel in 1912 (The San Francisco call., April 02, 1912). The woman who probably epitomized the whole phenomenon of young female boxers was named Ruth Helen Lang. Residing at the time in New York City at the luxurious Ansonia building, Miss Lang was originally from Victoria in British Columbia. According to her own testimony, shortly after arriving in New York Ms. Lang chose to take up exercise to maintain a colorful complexion instead of using “paint”. The nineteen-year-old woke up every morning at 5:30 and went for a four miles walk and had to repeatedly defend herself against aggressors. One of these altercations got the attention of reporters and she subsequently gave interviews about how she got a black eye but to use her own words “You ought to see the other fellow”. The policemen who took up Ruth’s declaration were quite taken aback as she reportedly wore “breaches that reach to her boot tops which are somewhat high.” She allegedly used a panoply of weapons to defend herself from dog whips to heavy canes and of course, her own fists, knees and elbows (Duluth News Tribune, May 20th, 1906). Unfortunately, I was unable to find out more about Ruth’s undoubtedly colorful life. The following is a transcript of a text she wrote and which was published in the Plain Dealer on the 30th of May 1911. To knock a man out hit him with the fist just outside the chin point.To drop him, hit him just beneath the ear. To put him out of commission, land him on the bridge of the nose between the eyes. If he comes up behind you, suddenly swing backward quickly with your elbow. This will catch him in the stomach and give you a chance. Don’t be afraid. Don’t hit a man unless you have to, but hit him hard. Follow these rules and you’re safe anywhere. 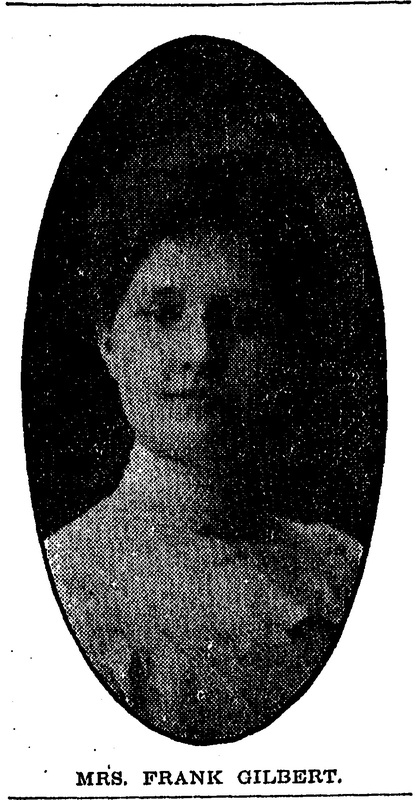 Miss Ruth Helen Lang, nineteen and possessor of an income of 1000$ a month astonished a New York masher recently by knocking him out in the first round. The masher had interrupted Miss Lang’s daily just-before-sunrise walk along Riverside drive, which she takes to improve her figure and complexion. The girl from the coast has knocked out quite a number of troublesome mashers in the last two years, and here she tells how any woman can do the same. The dangerous mashers are those who deserve the fist treatment. The dangerous masher is the creature who lay his hand upon you or who seems about to do so. When he does this a woman must lay him by the heels at once. The last dangerous masher I knocked out was last week. How I did it illustrates one of the methods of meeting the pest. This man was proud and vindictive. He showed his pride by resenting a girl’s refusal to speak to him. He showed his vindictiveness by giving me a black eye in return for the two I gave him. He could not have been a gentleman, for a gentleman will never change the color of a lady’s optic, no matter what she does to him. He was in fact, a villainous cad, and I hope he sees this. It happened in one of my beforehand walks which I take along the Riverside drive for my complexion’s sake. When I came to New York a year ago all the girls I knew powdered their faces and I did the same. But one morning I rubbed off the powder and said: I’ll do no more whitewashing. I’ll get up at 5:30 every morning and walk four miles before breakfast. And that was how I came to meet him. It was still dark. I heard footsteps close behind me. I turned and looked right into a face with red-trimmed, dissipated eyes. He insulted me. I let him walk close to me. He was watching my right hand. As he came close I swung at him. I caught him on the bridge of the nose. He nearly fell but recovered, came at me and landed on my eye. Then I gave him a blow behind the ear that sent him sprawling. Then he ran. Now observe that I hit him first between the eyes when he didn’t expect it. When I hit him the second time it was to fell him. I made a mistake. I should have followed my rule and knocked him out first, but I didn’t think he was so dangerous. I would advise every woman to get a punching bag and to practice the swift upward swing of the fist known as the uppercut. The quicker and the harder she can make the hit, the better the chance she has of discouraging the masher. The uppercut is good for close quarters. If the man is at one side, bring him up the arm with a swift circling swing and land on the ear. If the masher comes up behind you and catches your arm bring your elbow back as hard as you can against his stomach. Ten to one he will release you under the pain. Then turn quickly and give him the knockout on the point of the chin. If by any chance the masher has not got in front of you and is holding both your hands, bring your knee up with all the force you can into his stomach. None of them can stand that. Usually, I carry a heavy cane. That is an excellent weapon under certain conditions. I always try to hit the masher upon the elbow. The pain gives him all he wants to think about for a few moments and while he is wrestling with that he is in your hands to knock out as you please. It is a fact that few of these creatures have as much strength as a woman, decidedly not as much as a well-cared for woman. They are usually weakened by dissipation or are puny. Where a woman makes her great mistake is in becoming frightened. She does not remember it. Instead, the fear she had inherited from thousands of cave women who had to be continually watching for too impetuous and club wielding males overcomes her even now. She faints, she becomes weak, she does not use her wits nor her strength. And that is just what the dangerous masher counts on. Remember sisters, don’t lose your nerve. Hit and hit hard. He won’t wait for a second blow in nine cases out of ten. Get a punching bag and cultivate your muscle. Get out and walk and cultivate your health. Cultivate your nerve and your punch, and soon the race of mashers will be but a bruised and battered memory.